Martinez, Kincade named All-American by Hansen Football Committee. BROOKFIELD, Ill. — Texas A&M University-Commerce kicker Kristov Martinez and return specialist Reggie Kincade have been named second-team All-Americans by the Don Hansen Football Committee, as released Tuesday. Defensive end Michael Onuoha and offensive tackle Amon Simon earned honorable mention to the Hansen Committee teams. Martinez (Edinburg) earns his eighth career All-American honor, with six All-American honors this season after another record-setting campaign in which he set multiple schools, conference and NCAA records. After becoming the all-time leading scorer in program history in 2017, Martinez became the all-time leading scorer in Lone Star Conference history during his senior season. He finished his career as the active scoring leader in Division II (449 points) and the all-time leading kick scorer in Division II history. Martinez was also named a First Team All-American by the AFCA, Associated Press, and D2Football.com, First Team Academic All-American by CoSIDA, Second Team All-American by D2CCA, and was both a First Team All-Super Region and First Team All-Conference selection. He was also named the LSC Academic Player of the Year and to the Dave Campbell’s Texas Football Small College All-State team. He scored 111 points on the year, including 21 field goals and all 48 of his extra point attempts. He finished his career having made 103 consecutive extra points. 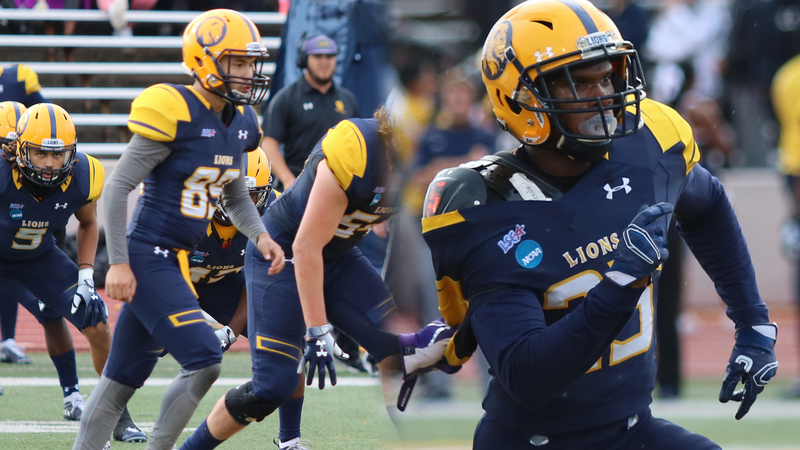 His strong leg helped the Lions rank as one of the top kick return defenses in the nation, recording 32 touchbacks. He tied a Division II playoff record with five field goals in a game, including a career-long 55-yarder, in the team’s final game of the year. Kincade (Everman) becomes a two-sport All-American with the Don Hansen’s honor, having earned track All-American honors in the outdoor 4×100 meter relay in 2016 and 2017. He had previously been named to the Dave Campbell’s Texas Football Small College All-State team and earned his first career all-region honor from the D2CCA thanks to a pair of kickoff returns for touchdowns – one for a school-record 100 yards against West Texas A&M, and another for 70 yards at Western New Mexico. For the season, he averaged 31.8 yards per return (668 yards on 21-return). He also had an interception, a blocked kick, and 23 tackles on the year. Onuoha (Edmond, Okla.) earns his third career All-American honor, as he was named first-team All-American by D2Football.com after making 47 tackles with 14.5 tackles for loss, 6.5 sacks, an interception, a blocked kick, and ten quarterback hurries. He played in the NFLPA Collegiate Bowl and forced a fumble after being named to the Dave Campbell’s Texas Football Small College All-State team. He finished fifth in the LSC in tackles for loss and tied for second in the LSC in sacks. He is a two-time all-LSC selection and earned D2CCA all-region honors in 2018. Simon (Humble – Atascocita) earns his first career All-American honor. He was a first-team all-LSC honoree for the first time in his career in 2018. He started in every game for the Lions as a redshirt sophomore, establishing himself as one of the league’s top young talents and most dominant linemen. The Don Hansen team carries out the legacy of long-time small college football advocate Don Hansen, who passed away at age 75 on Aug. 29, 2010. Hansen, from Brookfield, Ill., started and published Don Hansen’s National Weekly Football Gazette for three decades, selecting NCAA Division II All-America teams for the first time in 1988. Don Hansen’s Football Gazette began picking Division II All-Region squads in 2003. Texas A&M-Commerce: Michael Onuoha, DE; Amon Simon, OT.